Kentucky Equine Research Nutritional Expert, Catherine Whitehouse joins Bluegrass Horse Feeds at their Dublin Horse Show stand. With under a week to go until one of the biggest events in the Irish equine calendar, Bluegrass Horse Feeds will be continuing their celebrations of their 20th Anniversary of producing high quality and scientifically formulated horse feeds. Visit us at stand S802 for complimentary diet plans with our guest from Kentucky Equine Research. Dublin Horse show is sure to bring a week full of entertainment, show casing some of the top horses in Ireland with over 130 classes and competitions over the five days. Kentucky Equine Research (KER), equine nutritional expert Catherine Whitehouse, will be joining us at our stand (S802), to provide you with nutritional advice and personalised complimentary diet plans. Bluegrass Horse Feeds has been an official partner of Kentucky Equine Research since 2002. This partnership allows Bluegrass customers access to world leading nutritional advice and reassurance that their feed has been formulated to achieve the best results. Catherine graduated from the University of Lincoln with a Bachelor's degree in Equine Science. From there she progressed to her Master’s degree in Animal Science in the University of Kentucky under the direction of Robert Coleman, Ph.D and Joe Pagan, Ph.D. Catherine’s master’s research focused on the evaluation of apparent total-tract digestibility and glycemic responses to processed corn in non-exercised thoroughbreds. How did Catherine Join KER? 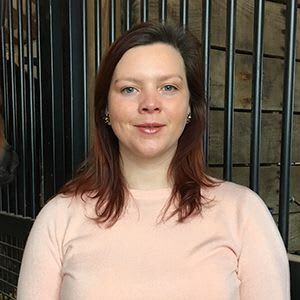 Catherine completed a 12 month internship at Kentucky Equine Research, an, on completion of her internship, she stayed the company to supervise the intern program and assist with research and development while completing her Masters. What is Catherine’s current role at KER? Catherine works with horse owners and clients to develop proper feed and supplement programs to optimize health and performance. Catherine’s main areas of interest include nutritional management of metabolic disorders and feeding performance horses. It can be a mind Field trying to find the correct feed for horses suffering from metabolic syndromes such as laminitis, insulin resistance or obesity. Catherine's expertise in these areas are invaluable, we are extremely excited for her to join use at our stand and provide horse owners with the opportunity to ask these questions and receive advice on a correct diet plan. Visit the Bluegrass Horse Feeds stand S802 to meet Catherine where she will be providing personalised diet plans. To Book your time slot for a personalised diet plan, email info@Bluegrasshorsefeed.com with your preferred day and time. The Bluegrass team will be available to answer any questions you may have on their product range. Keep up to date with the Bluegrass team and some special guests that will visiting their stand. Goodie bags, promotions, offers and a competition to win a night stay at the prestigious Castle Leslie Estate are all up for grabs throughout the week.